Are you Doing Instagram Photo Challenges Wrong? Raise your hand if you’ve ever taken part of an Instagram photo challenge? Whether it be a week long or a 30 day prompt challenge, it can be a really fun way to not only get new ideas for that dreaded “What should I post?” feeling, but it can also be a great way to meet new people and interact with your community! If you haven’t taken part in one before, here’s a quick overview. What is an Instagram Photo Challenge? An Instagram challenge is a set photo theme that’s hosted by an account or brand. They provide an overall theme, daily prompts for inspiration, and have a hashtag for everyone to use. Participants can connect with one another to see how others interpreted the prompt and occasionally there’s votes or ‘winners’ that might be featured on the main brand’s account if they like how the prompt was used! Why Would You Participate in an Instagram Challenge? Honestly, … because it’s fun! Instagram challenges also can foster a really fun community since everyone’s in on it together! So if you’re sometimes a little shy on Instagram and hesitant to reach out to someone new, let a challenge be your excuse. They’re also a great way to gain new followers. And it’s in a totally non-sleazy, spammy, follow/unfollow kind of way. YAY. Instead you’re taking advantage of the influx of people and concentration on a particular hashtag to stand out and earn some new connections! And luckily it’s an easy fix, just takes a little tweaking of your mindset. So, are you doing Instagram challenges wrong? Before I start – yes, I realize there’s not really a “wrong way”. But I strongly believe that if you’re on Instagram for your business, you should be using it to ultimately grow your business. Not just gain new followers. So instead of wrong, let’s say you might be confusing your customer. Here’s where I think some people approach Instagram photo challenges wrong. 1 | They introduce the prompt as the main lead in, instead of using that prompt as creative inspiration or a push to share something new with their audience. 2 | They’re too literal or get stuck on the prompt, even when it doesn’t fit with their brand. 3 | They’re too focused on the execution of the challenge and forget to focus on their own goals and targets. As an example, the prompt is “something yellow”. To be blunt – WTF guys. Your customer DOES NOT CARE you’re participating in an IG challenge… at least not how this caption is presented. If yellow is not part of your style or products… then why are you featuring it? If your account is primarily pink, gray and green, either have a purpose for the yellow or skip the prompt. Consistency matters! You just totally took your eye off the prize – your purpose for being on social media: which is customer engagement, providing value, building your customer base, and of course, sales. So how could we interpret this prompt differently? This is especially important for shop owners as your main customers may not also be creatives! It’s great to talk about the challenge and share because it helps the host, but you don’t necessarily need to call them out in the first line of your caption. Remember not to lose your customer in the process… always keep her involved in the conversation. Instead of burning up your first line, you could can add the hashtag at the end of your caption and call it out in a way that’s beneficial to your customer. You can still bring her “behind the scenes” of the challenge and share what you’re up to, but I wouldn’t lead off with that as the first part of your caption. Remember – Instagram only shows the first two lines of your caption before the “…more” cutoff, so make the most of this real estate to appeal to your customer! Okay, so let’s stick with the idea that yellow is not part of your brand. If it’s super far fetched – just ditch it. Move along. Missing one day of the challenge isn’t the worst thing. Instead, post an image that better fits your feed + spend some time supporting others in the challenge and reaching out to new accounts you connect with. If it maybe works, re-work the caption to help support that. Ask about their favorite colors, inspire customers to try a new color palette, or use that color in a creative way within the image so it still works in your feed. 3 | Keep your end business goals in mind. We all know Instagram can take up a lot of time + creative energy. So I think it’s important to keep your “eye on the prize” so to speak. inspiring them in some way (to try something, to learn something, to embrace a new way of thinking, etc)? nudging them towards a purchase? helping to build trust with your brand? showing a more personal side of you? Instagram challenges in and of themselves don’t really get you anything… so ensuring that your post still supports an overall business goal is important. It doesn’t throw in a random, “hey, guess I gotta try this!” kind of caption. And the caption is still focused first and foremost on you + your brand, while supporting + fully embracing the challenge. Sometimes I feel that I come across a little aggressive on this topic… so I hope you know I’m not at all saying not to enjoy the community or embrace the other makers. But I do want to encourage you to bring your customers along with the event, rather than just assuming they’re going to know what it is or care about it at face value. Help bring them into the fold. Share first from a point of view that matters to them, then direct them deeper into your brand or encourage them to check out the feed to find other fun makers! Joanne is an adorable designer + illustrator in the UK and actually is an Etsy Team Captain in Somerset! Joanne does an amazing job at organizing the challenge and inspiring and encouraging makers during the whole month of March. So if you’re looking for some creative energy, I definitely recommend checking it out. You can follow along on her Instagram @joannehawker or download the full prompt list here (she even created a planner to help you out). Is your Instagram account ready for growth? 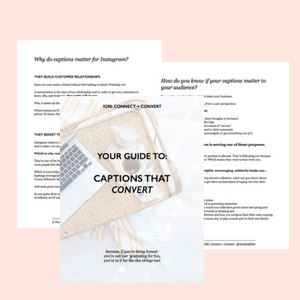 Grab this cheatsheet + walk away knowing that your account is set up strategically, get the visual grid basics down, make the most of captions + hashtags, how to post strategically; THEN focus on growth. Yes, I want the cheatsheet!